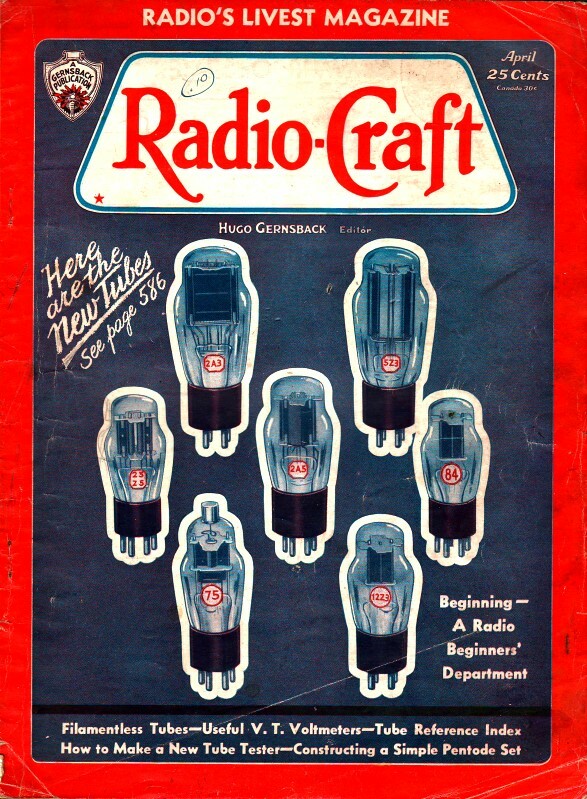 According to Radio-Craft magazine founder and editor Hugo Gernsback, during the Roaring Twenties era in the U.S. - and around much of the world for that matter - interest in the burgeoning field of radio communications led to as many as half a million new entrants into the field each year. As the novelty of the still-mystical wireless craft wore off and/or enthusiasts discovered the technical aspects were too challenging, the numbers ebbed to a quarter of the peak. The Stock Market crash in the Fall of 1929 didn't help matters, either. By 1933, Gernsback was writing, "The radio beginner these days is in a paradise of his own; he has low-priced merchandise, he has an avalanche of new radio circuits, and radio tubes of every class and variety." When radio was in its infancy - indeed, when it still was called "wireless" as it was from the years 1903 to about 1910, thousands of young and older men, attracted by the new art, started experimenting with wireless instruments. Even during that time, there were at least 50,000 new radio beginners every year. Later on, that is, during the period from 1910 to 1921, and particularly after the vacuum tube made its appearance, and wireless became radio, there were at least 100,000 new radio beginners who joined the ranks annually. Of course, not all of these experimenters stayed with radio. They started it as a hobby, and then, after the novelty had worn off and they had obtained all the thrills they wanted, they dropped from the ranks. From 1921 until about 1926, there was a tremendous jump in radio activities, and at least half a million radio beginners a year joined the ranks during those boom years. After 1926, the movement tapered off, until at the present time, we seem to have an average from 100,000 to 150,000 individuals per year who are interested in radio in one form or another. Of course, if all the old timers remained, the grand total would be tremendous; but the fact has been brought out, from observation over many years, that the activity of the average beginner doesn't last more than a year, if that long; but there are always new ones coming in, who replace those who drop out. During the past year, there has been a healthy increase, due particularly to the short-wave beginners, and those who are attracted to radio on account of amplifiers, public address systems, etc. Right now, the radio beginners, who are entering the field, seem to be not less than 200,000 a year. In an overwhelming number of cases, the man who embarks on radio experimentation today is still intent on building a broadcast set, even as he was of yore. Things are being made much easier for him today on account of the low cost of materials, and it becomes a. simple matter nowadays to build your first radio set. The attraction and mystery of radio is still there for the thousands upon thousands who have spare time, who are handy with tools, and who wish to embark upon the great adventure of radio. The thrills for the newcomer are the same as they were of old, and if the letters received by my various radio publications are any sign, the thrill for distance, be it broadcast of short wave, is still alluring for the new crop of radio beginners. It is all right for the other fellow to tell you that he has tuned in a station a thousand or ten thousand miles away, but doing it yourself is an entirely different matter, particularly if you have built a set yourself, and have learned to master its intricacies. The radio industry, for some reason or other, has always treated the radio beginner as the "forgotten man"; this is especially true of the parts industry which at one time thought that everything was over but the shouting, and many parts manufacturers went out of business. Those, however, who stuck to it, have found that while the demand for parts is not, of course, as large as it was during the radio boom from 1921 to 1926, yet, since then, there has been a steady flow of business which seems to increase of late. To be sure, there are not as many concerns in the parts business as before, due to the fact that a great many set manufacturing companies now make their own parts. During the boom years this was not true, and set builders had to buy their parts from parts manufacturers. Yet, the parts manufacturers have found that the demand for their products, from the beginners themselves, has not decreased, and even during the Depression, many radio parts manufacturers report a gain. This is particularly true for those parts which are used in short-wave sets, amplifiers, public address systems, etc. The reason for this is that every year there comes along a new generation of young people, a certain percentage of whom are beginning to get interested in radio, and these, of course, are the beginners. Then, too, older men are frequently bitten by the radio bug and get interested in radio from the experimental end. Usually, these men have enjoyed the experience of listening to a manufactured radio set and are normally radio fans. They become, in turn, radio experimenters, and they usually begin by building a broadcast set, anywhere from one to four tubes, of the simplest design. This is the average, because many are building very fine sets for special purposes: as, for instance, to fit special cabinets, closets, and the like. On the other end of the scale, we find the fellow who is still willing to play with a crystal set, and believe it or not, the demand for crystal sets has never fallen off. There are as many crystal sets being sold now as there ever were, except for a short period during the radio boom. The radio beginner these days is in a paradise of his own; he has low-priced merchandise, he has an avalanche of new radio circuits, and radio tubes of every class and variety. The old timers probably remember when we had to pay as much as $12.00 for a single WD-11 tube. Then, the radio beginner was in the luxury class. Today, he buys radio tubes for around 35c and upwards, the average tube costing less than $1.00. Also, today, the radio beginner has much better instruments for a fraction of their cost than they had during the boom years, and he has the added attractions of short waves and television thrown in for good measure. It is for this reason that I confidently expect that the radio beginners who join the ranks will keep on increasing for some years to come, and it is also for them that we have started a beginners' section in this magazine, in which we will print simple, but excellent sets for those who wish to experiment with radio and "build their own."